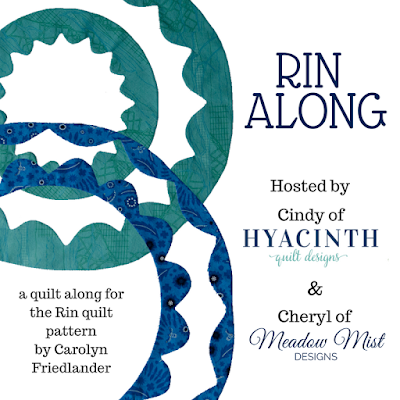 Cheryl and Cindy have kicked off a new QAL to make Carolyn Friedlander's Rin pattern. I have really been enjoying needle-turned applique since being introduced to the technique at a guild meeting. It took me awhile (and several practice attempts) to get the fabric folded properly to begin auditioning templates for my block. Once cut out, I pin basted and then thread basted. I've taken Carolyn's needle-turned applique class on Creative Bug and am following her technique of basting 1/4'' from the edge. I don't know if I'll make one block or a whole quilts worth but I will be using fabric from Moda Desert Bloom line by Sherri from A Quilting Life. I think I will take Carolyn's class on Creative Bug and get started on my block(s) soon, too. Starting with the easier single curve seems like the best idea, and aren't the folding instructions a bit baffling? I suppose all that matters is being consistent in how to fold. This looks so good Patty. I also had trouble with the folding. Had to get help from my son. Your Rin blocks looks awesome! I agree that the folding is the most difficult step.